Toledoan Norm Heydinger is really good with dates. He knows where he was and what he was doing over seventy years ago. He talks about it like it was yesterday. Then again… what Norm was experiencing at that time isn’t the kind of stuff you forget. World War II was underway and Norm would soon be a long way from his hometown of Toledo, Ohio. In January of 1944 Norm says he found himself in the middle of the South Pacific on the Navy ship Aquarius. He says he was an Ensign fresh out of the Coast Guard Academy where he studied enemy planes intensely so he would know with one glance if the enemy was approaching by air. Norm’s job on that ship was not only to watch for enemy aircraft, but also to help bring U.S. Marines in to shore for invasions. He says he did so for about half a dozen invasions in the South Pacific. He says his first invasion was in the Marshall Islands and his last invasion was Okinawa… a date he remembers very clearly: October 1, 1945. Only in his early twenties while in the South Pacific, Norm says he was on the main ship and they’d launch about a dozen landing craft that would hit the shore, deploying Marines. Then they would come back on board with the injured. “The hallways of the ship would be filled with guys lying there with injuries waiting for the doctor to help them,” he says. Norm remembers with all those injured, there was only one doctor on the ship. Other shocking images are still very vivid for him after all these years. “I remember Kamakazis flying all over, smashing into the sea, trying to hit ships… It becomes a part of you,” he says of those experiences. Another experience has stayed with Norm through the years, but this is a happy memory. It was an unanticipated family reunion of sorts in 1944, right in the middle of the war. 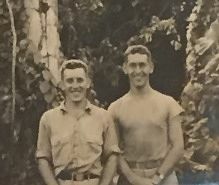 Norm says his brother Edward was serving in the Air Force and it just so happened that they were both at Guadalcanal, an island in the South Pacific that had seen intense fighting earlier in the war. Norm says when he got wind that Edward was so nearby, he managed to find him and they spent the day together. A picture from that day is still on the Heydinger refrigerator. Norm says Edward settled in Findlay after the war and was with Marathon Oil for many years as an economist. Norm says he left the Aquarius on May 8, 1945, another date very clear in his memory. It was V-E day, or Victory in Europe Day… which marks the formal acceptance by the World War II Allies of Nazi Germany’s surrender, though the war was far from over. Norm says he flew home to the US for a 30 day leave and was supposed to go back to the ship, with plans to go to Okinawa, but says instead he was transferred to shore. He called it the happiest day of his life. But, after spending the summer of 1945 in the states, he was shipped back to the Pacific on a Coast Guard cutter, the USS Gladwin. Named for a city in Pennsylvania, Norm says he’s always wanted to go there to visit. On the Gladwin Norm says his duty was in the North Pacific in Alaska for rescue and plane guard service. From there he says he went back to the west coast to San Francisco and left the Coast Guard in April of 1946. Two years later he met the love of his life and then another important date: June 24, 1950, when he and Dorothy were married. 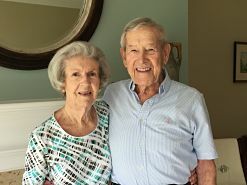 Norm says they just celebrated their 68th wedding anniversary and have four children, seven grandchildren and three great grandchildren. 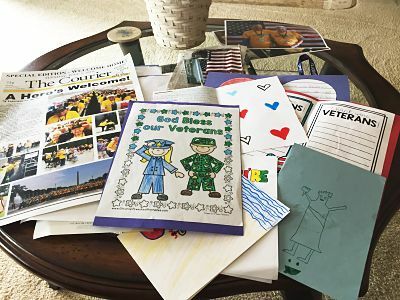 While many veterans prefer to leave memories of their wartime service in the past, Norm says he enjoys reliving it. He says he feels very fortunate and while he had some horrible experiences, he also had some wonderful experiences. He says shipmates became good friends, and he even had an opportunity to spend some time in Hawaii. 74 years after Norm shipped out to the South Pacific during World War II, came another date he will surely never forget. 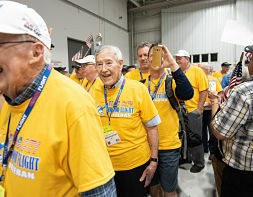 This past June 5th he was one of 76 veterans to travel with Flag City Honor Flight to Washington D.C. Seventeen of the veterans on board, including Norm, were World War II veterans. Norm’s son Peter was his guardian for the day, accompanying his father to the memorials. It was the first time Norm had ever seen the World War II memorial. He says one of the most impressive experiences on the trip was to see the Changing of the Guard at The Tomb of the Unknown Soldier at Arlington National Cemetery. Another memorable moment: the reception and homecoming celebration back at the airplane hangar in Toledo. Bad weather delayed the flight’s return a bit, but a large crowd was still waiting. Dorothy and other family members joined hundreds of others who formed a line to welcome the veterans into the hangar. The capper for Norm: local Boy Scouts handed him a bag full of gifts. Children had written him letters. “Truly amazing,” he says. He saved all the letters, notes and cards. Yes, Norm Heydinger has been blessed. He was given an Honor Flight over seven decades after his military service. 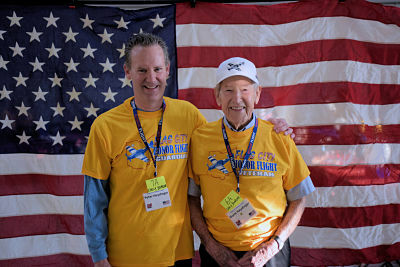 In fact, at 97 years old, he was the oldest veteran on the flight. He was able to walk the entire day in Washington with his own son and arrive home to a hero’s welcome, and, of course, to his Dorothy. Flag City Honor Flight operates two flights a year. The next flight is October 2, 2018. The nonprofit organization is run completely by volunteers and is funded solely through donations. Flag City Honor Flight is always in need of sponsors to help pay the way for veterans like Norm. Learn more about how to help at flagcityhonorflight.org. Gilmore Jasion Mahler is a proud supporter of Flag City Honor Flight, donating proceeds from a special fundraiser to help pay the way for more veterans like Norm to make the trip. The firm’s 2017 event Carnevale raised enough money to pay for an entire flight and then some. The next event, called Wanderlust will be November 1, 2019. Note: Flight photography courtesy of Flag City Honor Flight photographer Kelly Waird.